This past Saturday was the third annual “Small Business Saturday”. Shoppers were encouraged to “Shop Small and Support Local Business”. We would like to encourage your continued support of small businesses not just for one Saturday but throughout the entire year and especially through this holiday shopping season. Therefore, we have a fun shopping event planned next week just for you!! Mark your calendars and plan to join us in Cullman, Alabama on Friday, December 7th! Southern Accents will be hosting a trunk show in our upstairs gallery from 9:00 am to 5:00 pm! Lucy Farmer of Lucy’s Lockets will showcase her vintage jewelry collection and Southern Artist Mandy Maples Phillips will return with new beautiful works of art. These gals will also be bringing other unique items and ornaments that each have handcrafted from salvaged goods. We will also have our own selection of hand crafted items and antique goods available for purchase. All perfect for gift giving! Please bring your shopping list and join us for light refreshments and a relaxed shopping atmosphere. After browsing our unique selection of gift items you will want to step around the corner and visit our friends at 3rd Street Promenade. 3rd Street Promenade shows work of emerging and established area artists and is a fun place to visit. They are offering a 15% discount to Southern Accents customers. Just mention you came from our Trunk Show on December 7th to receive your discount while shopping with them! You will then want to venture a couple of blocks down to visit The Candle Garden. This beautiful shop is housed in a local landmark known as The Green House. They will be hosting their holiday open house on Friday and Saturday and are also offering a 15% discount to Southern Accents customers! Another noteworthy event worth checking out is the Christmas Arts & Crafts Show sponsored by Cullman City Parks & Recreation. Our own Leldon Maxcy will join over 70 other vendors at the Cullman Civic Center on Friday from 9:00 am to 8:00 pm and Saturday from 9:00 am to 5:00 pm. Admission is FREE. Southern Accents will also be offering a discount for all our customers on Friday, December 7th! 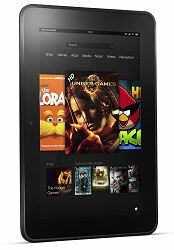 Shop with us and receive 15% off all regular priced merchandise purchases while here! Discount is not valid on wood shop services, shipping, or consignment items. Won’t you make plans now to join us in Cullman, Alabama on Friday, December 7th for a fun day of browsing and shopping a unique selection of gift items… and don’t forget about the discounts! Hope to see you HERE!! During this holiday season we would like to take the opportunity to let you know how very thankful we are. We value and appreciate our customers… not just during Thanksgiving, but each and every day of the year. Without you, we would not have the opportunity to do what we love. We thank you for your business. We also thank you for supporting us in our efforts to salvage and preserve a bit of history. We are also thankful for our community, for our country, for all the many freedoms we enjoy and for the many blessings that are daily bestowed upon us. We think that we live in the best community in the best country in the world! May we never take any of these things for granted. The Southern Accents team will be taking a few days off to spend time with our friends and family. We wish you a VERY HAPPY & BLESSED THANKSGIVING! If you’ve never had the opportunity to visit Southern Accents then you may not know that we are SO much more than large architectural antiques. We are a happy haven for artists, photographers, decorators, builders and crafty do-it-yourselfers! This is the first in a series that we are doing to introduce you to some of the artistic people that we work with. Meet Lucy Farmer! Lucy has worked with Southern Accents the past couple of years and was instrumental in launching our social media marketing campaigns. Lucy still works with us on marketing and branding projects and is currently helping design our booth for the big Home and Garden Show next February in Birmingham, Alabama. Lucy recently started her own blog, Lucy’s Inspired, where she is chronicling her building project of what she calls her ‘Hansel & Gretel’ home. Lucy has a love for everything old, vintage and antique and is also socially conscious of the need to recycle used materials whenever possible. It was no surprise when she came to Southern Accents seeking salvaged materials for her building project. When Lucy is not working on her cottage you might find her working on her line of vintage inspired jewelry, Lucy Lockets. Lucy started making jewelry several years ago as a hobby. She was drawn to old vintage and antique pieces of hardware and other items she would find lying around and decided to turn them into wearable art. 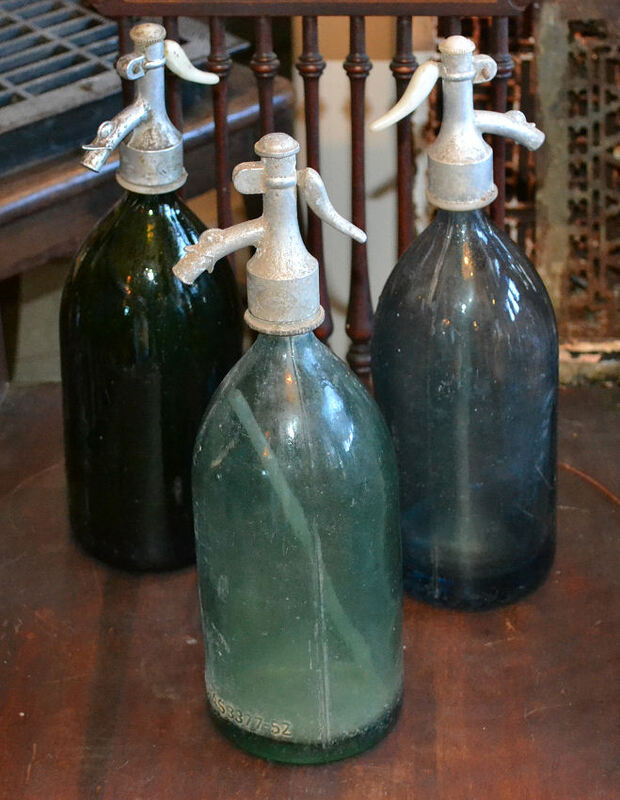 Lucy frequents antique stores and vintage markets looking for small pieces that she can incorporate into her designs. She even admitted to finding and using ‘junky’ items lying on the side of the road! When asked what inspires her, she said that each old item tells a story. Often pieces will remind her of something she saw as a child in her grandmother’s home. She hopes that her jewelry will evoke the same fond memories for those wearing it. Lucy stopped by the store this week with several of her latest creations. Each piece is a one-of-a-kind work of art. When asked her reaction the very first time she walked in to Southern Accents she said, “I thought I had hit the jackpot”. This is the perfect place to search for old pieces for my designs”. Lucy has been spending a little more time lately on her jewelry creations even custom designing pieces for some of her clients. “I love to take a personal item, like an old piece of jewelry from someone’s grandmother, and incorporate it into a custom design.” Lucy also loves the fact that she can create her jewelry at home which gives her more time to spend with her children. If you want to read more about the Hansel and Gretel cottage or about Lucy’s Lockets, you can follow Lucy on her blog, Lucy’s Inspired. We’re inspired by Lucy and share her passion for preserving the past any way we can. Recently one of our local schools, East Elementary, partnered with PALS (People Against a Littered State) to challenge its students to create art projects from recycled materials. The students could build a 3-D model, sculpture or replica using items and materials found around their home. The only non-recyclable items they were allowed to use were items needed to hold the project together, such as tape and glue. They were also allowed to use paint to decorate their project. The students were allowed to work individually or in teams. This project was designed to promote both recycling and creativity among the students. Once the projects were submitted, they were distributed among several businesses and offices throughout Cullman to be displayed through the month of November. Southern Accents is proudly displaying two of these works of art in our showroom and are thrilled to help promote this project. The adorable rooster was submitted by 5th grader Morgan Dingler and the colorful bead bowl is from 4th grader Coleman Callan. We had a chance to meet these two students along with teacher Lindsey Howard, the project sponsor. As we explained to Morgan and Coleman, our business is very much like their art projects, only on a bigger scale. We look for salvage items that can be reused, recycled or repurposed into useful items or beautiful works of art. We are extremely proud of all of the students who participated in this exciting project. 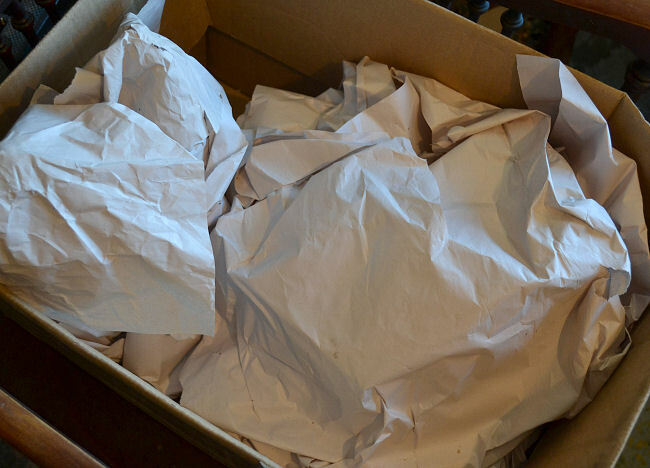 It is our goal at Southern Accents to promote recycling efforts as well as create an awareness of the need to preserve items of historical value. Be sure to stop by Southern Accents to view the students work as well as all the beautiful antique and salvage items currently on display in our showroom. 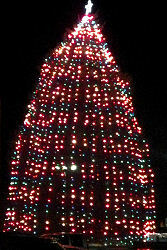 Earlier this week I was driving through Cullman and caught a ‘sneak peek’ of the Christmas tree lighting! The guys in the bucket truck had just hung the last strand and were calling it a night when I snapped this picture. Each year a huge cedar tree is placed in the middle of the shopping center and covered with lights. Yes, it lacks the grandor of the Rockefeller tree in New York City, still, there’s something magical about all those lights shining brightly against a dark sky. Lights, for me, are a sign of hope and isn’t that something we could all use a little more of these days? For a moment that big ole’ cedar evokes romanticized thoughts of magical moments around the town tree. The kind of moments we all secretly enjoy watching in all those sappy Hallmark holiday movies! C’mon ladies… you all know what I’m talking about! Cullman is still very much small town USA. Not quite Mayberry but not too far removed. Those of us privileged to live here love our town and this weekend we will all come together to celebrate. Young and old alike will gasp when the tree is officially lit and delight at the wide eyed children as they anxiously await Santa’s arrival. The store windows are decorated, the light poles have been draped in garland and the lit snowflakes hung. The high school band has been rehearsing all week for the parade and I’m certain that Santa has his bags packed in preparation for his trip down from the North Pole! Won’t you join us for the 27th Annual Christmas in Cullman? The parade route will start at the Busy Bee Cafe at 101 5th St SE. 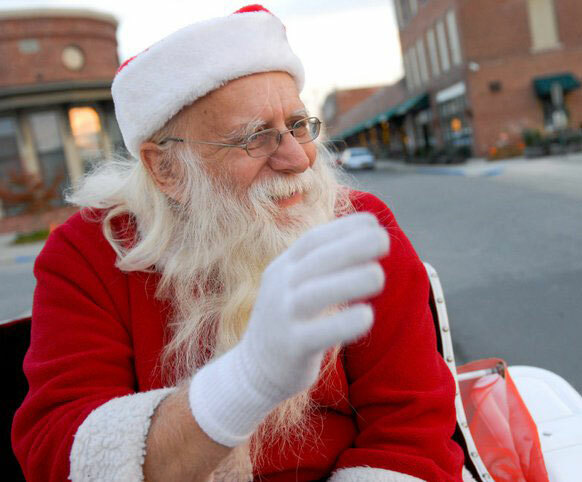 The parade will feature the Cullman High School Band, Santa and his sled, the cow train and a host of other merry-making elves! The Official Christmas Tree Lighting for Christmas in Cullman will take place at 6:30 pm Saturday at Depot Park. Come enjoy a weekend of fun events for the entire family. Don’t forget to add SOUTHERN ACCENTS to your ‘must do’ list while you are here!! We will be hosting an art exhibit upstairs from Southern Artist Mandy Maples Phillips. We’ve been working hard all week preparing the store for this special celebration. Please stop in, say hello, and take a look around. We would love to meet you! Yesterday I ran in to Wal-Mart (yes, I am a Wal-Mart shopper) to grab a few grocery items needed for today’s tailgate party. For some reason, unknown to me, I am one of those people that strangers feel comfortable engaging in conversation in Wally World. Most often I am asked if I know where something is. I always do. Quite often I am asked food questions. I love to cook and love to talk food and am always flattered that someone would ask for my food advice, even a stranger. I share what I can before moving on to the next isle and the next customer question. I often find myself looking to see if someone has stuck an employee tag on my back as a joke or wonder if I resemble Martha White? Anyway, sometimes this works in my favor, as it did yesterday. I was in the produce section digging through the cilantro. This man walks up and asks, “What are you doing with that?” My reply, “I’m making Texas Caviar. Tomorrow is fajita night”. He told me that he was from Texas, had moved to Cullman a couple of years ago, loves spicy Mexican food and then began to share his easy pico recipe with me! SCORE!! I normally do not like ‘prefab’ recipes. I’m a ‘from scratch’ girl but… it’s been a busy week. I’ve got 20 people showing up at my dirty house tonight to tailgate for a BIG SEC FOOTBALL GAME. I will spend all day trying to get my house in some sort of acceptable order before firing up the smoker. Easy pico…I’m in! I literally threw this together in less than 10 minutes. Drain the can of Rotel. I sliced off about 1/4 of a jalapeno pepper and 1 slice of onion and finely chopped both. I added about a good teaspoon of each to the Rotel. 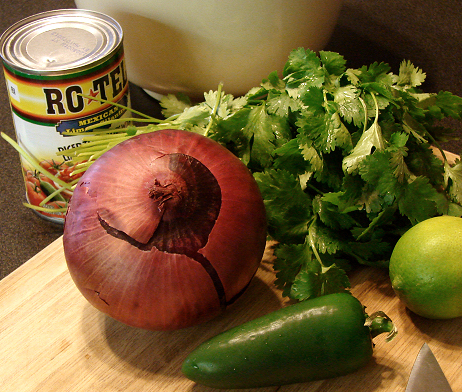 I finely chopped and added a handful of cilantro, about a tablespoon once it was chopped. I added salt to taste and squeezed the juice of 1/2 of a small lime. Toss and your done! 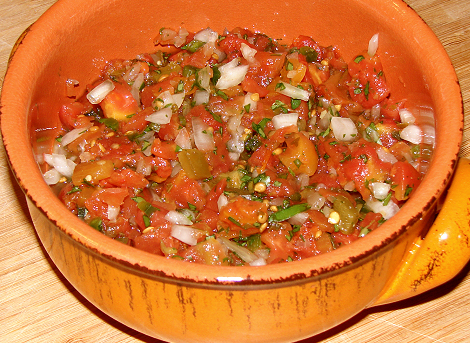 Although pico mixed with your early morning cup of coffee is not the best combination, the taste of the pico is spot on! You can tweak this recipe according to your taste. I made two batches just to make sure we had enough. The guys at Southern Accents are working hard today. I’ll be sending them signals from my smoker later this afternoon. I’ve been told that I make the BEST chicken fajitas this side of the border… I’m sure they are hoping I’ll throw them some leftovers!! 😉 If you are in the area please stop by the store and say hello. Tell them I said ROLL TIDE! Thank you former Texas resident Wal-Mart man for this recipe. It’s a keeper! I used the remaining cilantro in my Texas Caviar. If you’ve never had Texas Caviar, I make a pretty mean one. Perhaps that will be my next recipe share?